In honor of the third anniversary of the passing of Avatar Adi Da’s physical Body, we offer this exceptional collection of Adi Da’s Instruction covering the significance of this Yogic Event, the ever-present Gift of the direct relationship to Him, and the never-ending Nature of His Work to Bless and Awaken all beings. On November 27, 2008, Avatar Adi Da Samraj took Divine Mahasamadhi, relinquishing His physical Body in a sudden moment of utter peacefulness. Since the time of this supremely significant Event, His devotees have studied all the Instruction Adi Da Samraj gave regarding His physical passing, the ongoing devotional and Spiritual relationship to Him, and all the Means He Gave for direct contact with Him, in perpetuity. An uninterrupted thread of Communication from Adi Da Samraj about these matters was discovered—beginning in His very early years of Teaching, and not ending until the day of His passing. I Am the Infinite One. And This Body was My Means, for a while, to make this plain to you—that is all. I Appear through every element in every plane, every domain within the cosmic domain. This is So. It is Eternally So. Always will be So, therefore. Always was So—but you did not notice Me directly. This is My first and consequential Incarnation to inform you about My Infinite and Eternal Nature and Work. 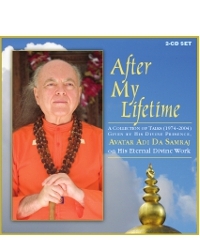 We invite you to consider Adi Da’s Communications on these CDs as a means to feel His Eternal Divine Presence, discover the Great Mystery of His universal Blessing-Work with all beings, and understand the ongoing nature of the unfolding Realization-process in His Company.